Building a 12 key Facility for the Jazz Bassist breaks down the jazz bass vocabulary by outlining key areas of harmonic structure related to the jazz standard and bebop styles. As in the earlier books in the series the lesson material builds in a stepwise manner enabling the student to build on the solid foundational material discussed in books I - III. All lessons are applied to all 12 keys with written out bass lines and 333 MP3 backing tracks applied to 10 jazz and bebop standard chord progressions with over 150 choruses of written out bass line examples. 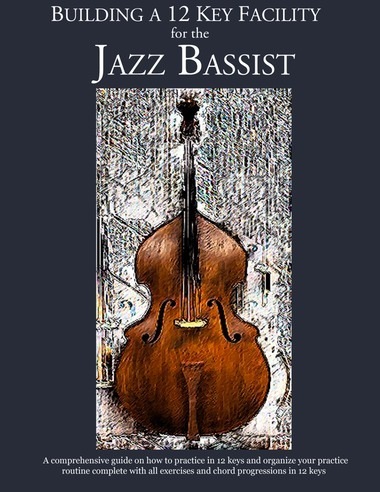 By practicing the material presented in this book, Book I of the series the bassist builds technical facility and expands on their jazz vocabulary by practicing the key harmonic structures used most often by jazz bassists in the jazz standard and bebop styles. Presented in this book and outlined with written out examples in all 12 keys are the fundamentals required by the professional jazz bassist. The II V I in major modulating to II V I in minor Voice Leading The I VI II V over 2 and 4 measures The I VI II V progression and the secondary dominant chord The V of V cycle The I IV III VI progression The bVII Dominant 7th chord & the IV Minor bVII7 progression The IV Minor bVII7 progression The IV Major to IV Minor bVII7 progression Turnarounds into the II IV & VI chords Diatonic chord structures & the II V into the IV chord Bridge Tritone substitution Tritone substitution chord progressions Accents, phrasing & anticipating the chord changes The Minor key tonality & the Minor II V progression The descending Minor II V I Bridge Tritone substitution of the Altered dominant chord. Building a 12 Key Facility for the Jazz Bassist Book II is dedicated specifically to chord and scale studies in 12 keys. Featuring major scale studies and modes, minor scale studies, diminished, wholetone and augmented scales. With written out examples of how to practice the scales, chords and modes in all 12 keys. A Masterpiece, " A Must Have" for any aspiring Jazz Bassist or Jazz Pianist. Once again ,Mr Mooney delivers!! Clearly outlines the language of our jazz harmonic foundation. Demonstrates how to "walk the walk" and "talk the talk"